You will be coming in on Hwy. 290. Turn left to go through Burton. At the four way stop sign in Burton, turn left. Stay on this road, FM 390. Stay on FM 390 until FM 1948 intersects it. Turn left onto FM 1948. Go 2.9 miles, then turn right (staying on FM 1948) and go another 2.9 miles. Our entrance is a stained wood board fence with a red brick entrance and a black metal gate. The driveway will take you up to the house. Directions from Hwy. 290 W. - Take Hwy. 290 West out of Brenham. Go 8.1 miles from the loop. When you see Nueces Canyon Ranch on your left, turn right onto FM 1948. Go 1.9 miles and stop at the stop sign. Proceed left, staying on FM 1948. Approximately ¼ mile further, FM 1948 will turn back to the right. Say on FM 1948. Go 2.9 miles, then turn right (staying on FM 1948) and go another 2.9 miles. Our entrance is a stained wood board fence with a red brick entrance and a black metal gate. The driveway will take you up to the house. Directions from Hwy. 36 N. - Take Hwy. 36 North out of Brenham. Go 9.6 miles from the loop. Turn left at the flashing light at FM 1948. There is a Shell Station on the corner. Go 5.3 miles down FM 1948. You will see Rocky Creek Park to the right, continue straight, go another 1.3 miles down the road.. Our place is the stained wood board fence with a red brick entrance and a black metal gate. The driveway will take you to the house. Take FM 60 to Hwy 36. Turn left on Hwy. 36. Continue driving towards Somerville. Just as you approach the town, there is a B&B Grocery on the right. Turn right on the road that runs along the side of the B&B Grocery. This road will take you over the Lake Somerville dam. Stay on this road until you reach FM 1948. Turn right on FM 1948. Go approximately 5 miles and you will see Rocky Creek Park on your right side, continue straight, go another 1.3 miles down the road. 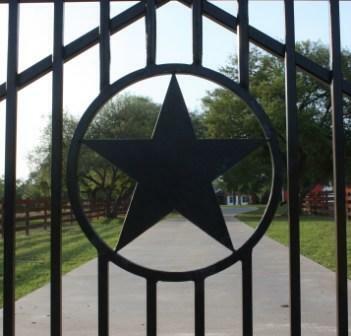 Our place is the stained wood board fence with a red brick entrance and a black metal gate, which is usually opened. The driveway will take you to the house.